Having said all that, she’s the blogger in question: a writer, reader, and a force of nature. Shoujothoughts: Cute is a /physical/ attribute. Husband: *pulling her closer* Nope. Believes that much of his feelings are meant to be understood without verbal expression??? To end with, his blue/green eyes are beautiful. His laugh is silly, his teasing eye-roll inducing. His goals are lofty. His thoughts are hard to reach. His heart is Shoujo’s claim. Shoujothoughts: *crocodile pouting* Why are you so mean? Husband: *smiling while walking away* Because I can be. 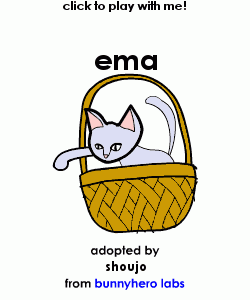 Husband: *approaching Neko-chan so she meows* Meow if you love me the most!